Michael Pearl, "Parenting, the most important and demanding job in the world comes on us by default. Ready or not, prepared or ill equipped, all parents produce fruit that lasts throughout eternity. . . . The melody or the dissonance goes on and on from one generation to the next unless someone takes the time to break the cycle and learn the skill…of parenting." The following was posted on No Greater Joy Ministry's Facebook Page. Take the time to add No Greater Joy to your friend's list today! 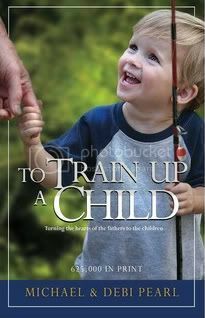 It has come to may attention that a vocal few are decrying our sensible application of the Biblical rod in training up our children. I laugh at my caustic critics, for our properly spanked and trained children grow to maturity in great peace and love. Numbered in the millions, these kids become the models of self-control and discipline, highly educated and creative—entrepreneurs that pay the taxes your children will receive in entitlements. When your children finally find an honest mechanic or a trustworthy homebuilder, it will be one of ours. When your children apply for a job it will be at a company our children founded. When they go to a doctor, it will be one of our Christian children that heals them with cutting edge innovation. When your adult kids go for therapy it will be one of our kids-become-psychologist that directs them to the couch and challenges them to release their self-loathing and embrace hope for a better tomorrow. When your children grow old and realize their mortality and seek to make peace with their Creator, it will be one of our children that shares with them the message of God’s love and forgiveness. My five grown children are laughing at your foolish, uninformed criticism of God’s method of child training, for their kids—my 17 grandkids—are laughing . . . because that is what they do most of the time. They laugh when Daddy is coming home. The laugh when it is time to do more homeschooling. They laugh when it is time to practice the violin and piano. They laugh when they see their Big Papa coming (that’s me) because Big Papa is laughing and they don’t care why just as long as he laughs with them. My granddaughters laugh with joy after giving their baby dolls a spanking for “being naughty” because they know their dolls will grow up to be the best mamas and daddies in the world—just like them. People all around the world, in places like Russia, China, Germany, New Zealand, Guatemala, Peru, Africa, and fifty other countries are laughing with joy because after applying the Biblical principles found in our books they finally have happy and obedient children. and find out what all the squawking is about.